Welcome back for week #2 of the Survival Book Bonanza Giveaway! 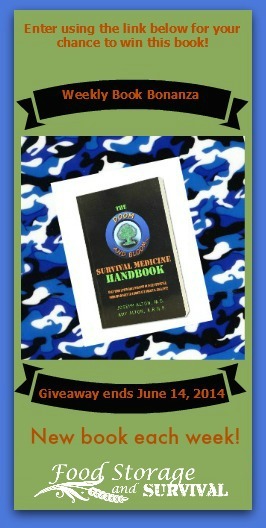 This week we have a copy of The Doom and Bloom Survival Medicine Handbook – First Edition to give away! And who doesn’t need a little survival medical instruction? Written by Joseph Alton, M.D. & Amy Alton A.R.N.P. (aka: Dr. Bones and Nurse Amy of DoomandBloom.net) with the precision of those in the medical field yet in terms any layman can readily understand. This book covers a wide array of topics and is an easy read and well formatted for finding what you need to learn. Sections include: ‘Principles of Medical Preparedness’, ‘Becoming a Medical Resource’, ‘Hygiene, Sanitation and Environment’, ‘Infections’, ‘Environmental Factors’, ‘Injuries and Reactions’, ‘ Chronic Medical Problems’, and ‘Other Important Medical Issues’ such as nosebleeds, stockpiling medication, etc. Each section within The Doom and Bloom Survival Medicine Handbook – First Edition has multiple sub-sections to help you become better equipped to handle the incidents that can occur during disaster. From Cellulitis to Snake bites, Dr. Bones and Nurse Amy address so many things in this 419 page book. The book also includes a Glossary (which can be very helpful to a novice or those unfamiliar with medical terms) and other Medical References. There is a Second Edition: The Survival Medicine Handbook: A Guide for When Help is Not on the Way. The one we are giving away is the First Edition that covers the building blocks to address almost every given emergency. 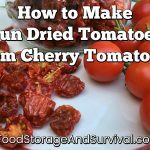 Wouldn’t it be a great addition to your preparedness library? You bet it would! So enter below. Come back and Tweet daily to increase your chances of winning too! This would be a great addition to my preparedness library! Thanks for the opportunity.